This year, I felt for some reason like I was drawing a blank when it was back to school time and I was trying to think of what I needed to make sure I had. I also was mentoring a new teacher so I was trying to be organized. 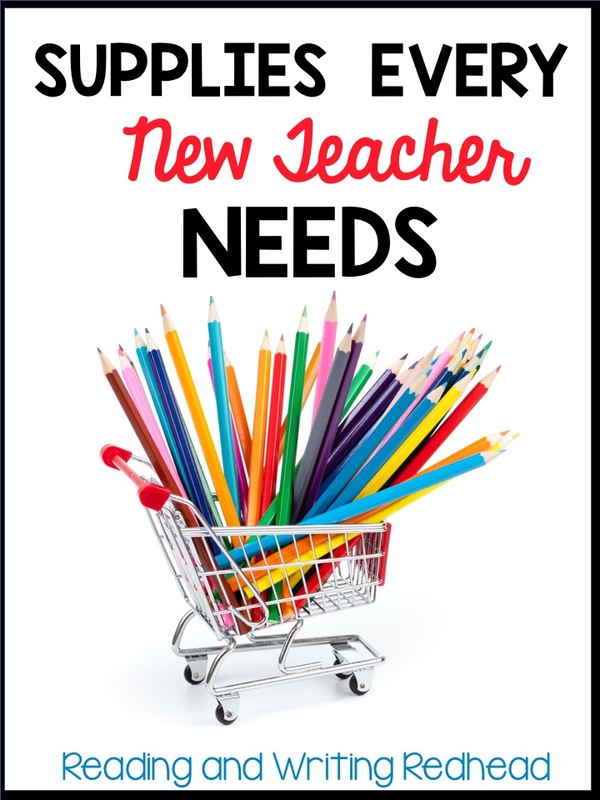 After getting organized I thought of how I would have loved to have a list of what supplies I needed back when I was a new teacher... and apparently I could use some reminders now. So I put together a list of my most used and my favorite supplies for you with a little comment or two about each. Clicking on each image will bring you to Amazon to get more information (affiliate links). You already know teachers love their flair pens. Great for correcting, note taking at meetings, drawing... just A+! Sharpies are my go to for writing on chart paper and labeling EVERYthing. All sizes- for corralling papers of all kinds! You need some kind of system for all of the papers and notes you will be sending home. If you don't invest in a mailbox system, put something else in place on day one. Don't try what I did my first year - trying to pass everyone out a notice, homework and other papers at the end of the day. Countless papers got lost and left behind! More on this in an upcoming blog post but you don't need to go crazy as a new teacher with Pinterest worthy boards. Just get some papers and borders up. Shop around for good deals. And did you know there is now magnetic borders? Eek! Check Lakeshore for them - only sold in stores at this time. Everyone needs one! Check for good deals at WalMart or ask parents to donate some. Not one, but at least two or more. If your school only gives you one, you should look into getting extras. It's worth it! Let't not kid ourselves. Dixon Ticonderoga is the best out there. Easiest to sharpen, last longer and those presharpened ones are amazing. I ask parents to donate them. Get several sizes - plain yellow is fine but just have a bunch. Countless uses! If you are new to teaching you might be surprised how many you need and how many uses there are: broken jewelry, game pieces, task cards, leftover snacks, and the list goes on. Have several sizes. Essential! Have students wipe desks and tables daily. Might seen obvious but needed! if you are new and have to get your own, just start with hand sharpener and ask parents to donate an electric one or hint that it would be a great holiday gift (If parents do that). We have those terrible cinder block walls which are hard to hang on and my chalkboard (one whole wall of the room) isn't magnetic so Stikki Clips are a godsend. You can also try things like command hooks, putty, and duct tape. What is on your must have list for new teachers? Let me know what I missed with your comment below!